On Saturday, one of my dear friends came over for a visit. We originally met in Austin several years ago at a sock class, hit it off, and were both surprised to discover we lived in the same small town. We have traveled many a mile on yarn crawls, and we even ventured to the MadTosh store in Fort Worth with another sweet friend one time on a road trip for the ages. It had been a while since we had been able to get together, but the thing with good friends, it is so easy to pick up where we left off. When she came in, she explained her boss' wife was a crafty lady whose mother-in-law had passed away and had a Macomber loom (squee! ), but before she could call dibs on it, the family sold it (dang!). 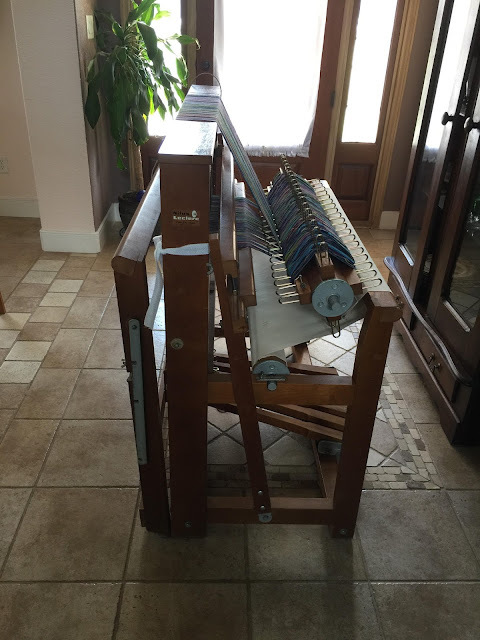 Then she (my friend) announced she thought she might like to learn to weave because she wanted to make some of those tea towels and baby wraps and blankets she saw coming off my looms. Let's just say that by the end of the afternoon she wanted to buy the sweet Leclerc loom I rescued from a barn this past April. While I was not at all opposed to selling it to her, I advised that we could find her a loom just like her for less than what I had in her. Did I mention my friend is extremely smart and wise? She said she had no doubt that we could find a less expensive loom, but she would probably have to spend as much, if not more, to get another loom up to the standard this one was now. I think her words were something to the effect "she is beautiful, and if she is good enough for you, she is good enough for me." I told her what I paid for the loom originally and printed out the receipts for the parts I ordered. We struck a deal. 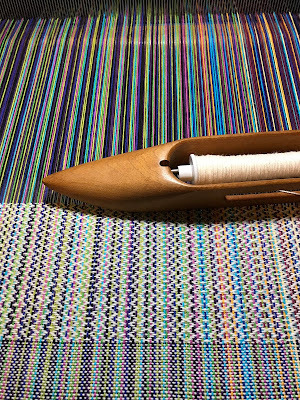 On Sunday morning, I pulled off the tea towels I had already woven on her, and re-lashed the remainder of the warp, and prepared her for travel. She was too wide to get through the doors, but at her husband's suggestion, we were able to take the back beam off without disturbing the warp too much. She traveled beautifully! Later that day, her husband and a friend came over to pick her up. I followed them across town and helped her set it up. Now, there was originally a 14-yard warp on that loom, and I had only used about half of it on tea towels. I pulled off what I had woven, and re-lashed on the warp for her to start fresh. Because we live in the same town, once she finishes the warp, we are going to work together to teach her to warp a plain beam using a warping mill, as well as a sectional beam using a tension box and cone stand, but we have plenty of time for that. 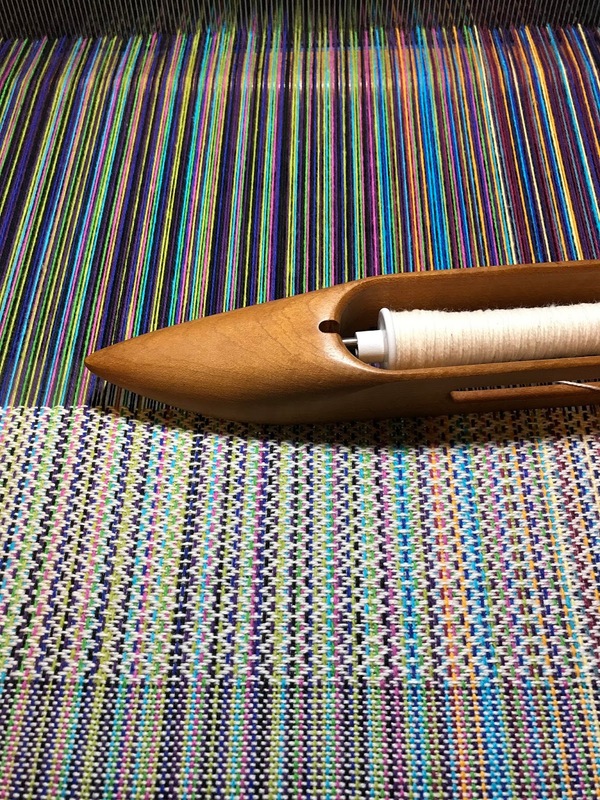 First of all, most people, me included, begin weaving by doing nothing more than even weave for months and months... Not my friend, she jumped right in to a pattern using every treadle she has with both feet (literally) and never looked back! What impresses me most about my friend, is that she is fearless and she only requires things to be explained to her once, and she has it. Floating selvages were used because there is a design in this pattern. However, as the original plan was for even weave, I added the selvages after I had already warped the loom. So, I tied the selvages on last. The threads were wrapped around weighted pill bottles and secured by rubber bands. (Classy, I know.) I explained I used the same set-up when I occasionally snapped warp threads and added them to the fabric by using T-pins with the threads wrapped around the pins in a figure-8. This morning, my friend emailed me and said one of the floating selvages had broken and she remembered what I had said (I had not even really shown her), and she was able to re-attach it with a pin and the thread wrapped around it in a figure-8! Well done! We have a fine new weaver! I think the lovely Leclerc and my beautiful friend will be very happy for many years to come!! I could not be happier for them! Now, if anyone knows of a Macomber 32" 8-shaft or 12-shaft who would like to come live with me, please give a shout.